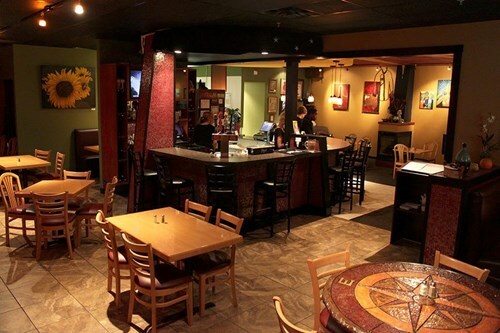 The The Coffee Bar is a restaurant inside Mystic Lake Casino Hotel in Prior Lake, Minnesota. Great Breakfast. Excited to go back and try more things on the menu. Service was a bit slow, not the fault of the server, she was fantastic. I liked Artisan in the past, but tonight was a disaster for this unique(for the area) bistro. We made a reservation, and they sat us in the cafe. Everyone after us was seated in the restaurant which has better tables, service, and lighting. Service was slow. I asked if they had any IPA's and was told no. They did after I investigated. Silverware was assembled the next table over, and not on our table until I asked when the food came. Burger was dry, but flavorful. Probably won't be back. One of the best meals I've had in a long time! My husband and I were impressed with the service and food. The homemade ranch dressing and croutons were delicious. He loved the steak salad, and I was a huge fan of the bruschetta chicken. We will definitely be back. Highly recommended! i found this gem in the strip mall in prior lake. what a great place for a lunch dinner or a beverage great service at the tables and the food is unbelievably great like a home cooking but many options. VERY cool environment here. They have it well decorated and clean. Good food is always a good thing too! I use to LOVE this place, but after it went under new ownership I’ve had a bad experience every single time. I tried giving it a few more chances hoping the other bad times were just flukes, but the poor experience was consistent. We no longer go now. The food is terrible now. Ingredients and specific instructions were forgotten every time without fail but I don’t think it’s because of the waiters/ waitresses (they were always nice and attentive). It feels like the errors were coming from the kitchen. The time it took for the food to get to our table was literally at the least an hour, and they stopped serving their gluten free options. Won’t be returning until they get their act together! I want the old owners back! Seriously use to be my favorite place. Excellent service. Good food. Not cheap but excellent value. Very nice atmosphere and very nice workers! The potato’s and greens were super fresh!